Grab your amigos, and let's get day drunk! Enjoy running around bar to bar on Hollywood Blvd and partake in EPIC drink specials from 10+ participating venues! Venues include: Station 1640, Rusty Mullet, Wood & Vine, Calle Tacos, Jamesons & more! Station 1640 will be hosting the 'Backyard Cinco Party' which includes an outdoor & indoor area with live bands, DJs, a beer garden, food vendors, & a FREE margarita tasting from 15+ 2pm-5pm! How this Cinco De Mayo Crawl works: Check in at The Rusty Mullet & receive a wristband and a map of participating venues. Check in before 4pm and receive a FREE WELCOME SHOT at Rusty Mullet. The first 100 people to check in will receive a small Cinco De Mayo themed gift! Grab your amigos, and let's get day drunk! 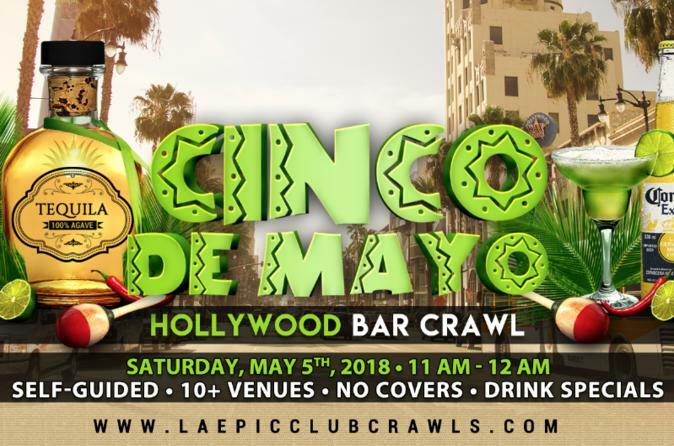 This Cinco De Mayo in Hollywood you're making the rules!From the hours of 11 AM to 12 AM you and your friends get to enjoy running around bar to bar on Hollywood Blvd and partake in EPIC drink specials from 10+ participating venues! There are over 10 participating venues. Venues include: Station 1640, Rusty Mullet, Wood and Vine, Calle Tacos, Jamesons and more! Station 1640 will be one of our featured events, as they will be hosting the 'Backyard Cinco Party' which includes a large outdoor and indoor area with live bands, DJs, a beer garden, food vendors, AND a complimentary margarita tasting from 15+ of the best bartenders in LA from 2pm - 5pm! How this Cinco De Mayo Crawl works: On May 5th you will check in at The Rusty Mullet, between 11am - 5pm. You will receive a wristband and a map of participating venues. The venues will be marked on the map along with all the different drink specials. Check in before 4pm and receive a FREE WELCOME SHOT at Rusty Mullet. The first 100 people to check in will receive a small Cinco De Mayo themed gift!